Ferguson Funeral Home Museum - American Folk Art, Carvings, 1880 Rock Falls Hearse 1880, an instrumental part of the history of the undertaking business, east of the Mississippi. 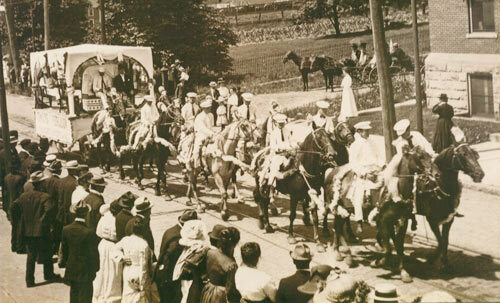 A quasquicentennial celebrates 125 years of history. With over 125 years of service, Ferguson Funeral Home is the site of the Scottdale community’s oldest business, dating back to 1880. We are located at 105 Spring Street in Scottdale PA, in Westmoreland County. Over four generations of funeral directors have been trained to give the highest quality of service to our customers. In addition to the funeral home, our facilities feature a historical museum that houses American Folk Art, including hand-made carved wooden artifacts from the William Ferguson Collection. Part of this collection includes grandfather clocks and windmill clocks. 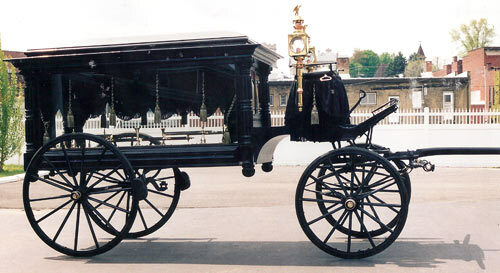 The museum also houses a nineteenth century horse-drawn hearse that is still in operating condition. The Ferguson Funeral Home is housed in a Colonial Revival styled home that is elegant, well-maintained, and reverentially decorated. It was constructed in 1936 and was one of the first blueprinted funeral homes east of the Mississippi. Prior to the location on Spring Street the William Ferguson Furniture and Undertaking establishment was located at 120 Pittsburgh Street, Scottdale. More than anything else, having surpassed our 125th year of service demonstrates both our commitment to the community and the quality of service available at the Ferguson Funeral Home, a commitment to service which has kept our business growing for generations. Looking for information on the Wil Ferguson Collection? Visit our Collection page for more information? What does the 1880 Hearse look like? Our 1880 Hearse page shows the restored version. Visit our Generations page to learn more about our business history from Samuel D. Aultman to Robert B. Ferguson, Jr.
Our History page is an extensive look at the business owners throughout the 125 years of business. 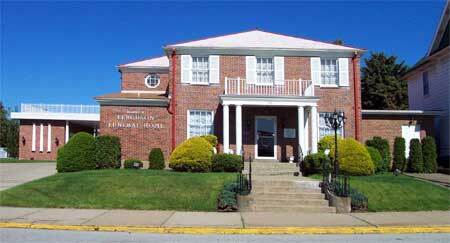 Contact Us for an appointment, for more information on Ferguson Funeral Home Museum, or with any question you may have. We will be glad to assist you. The funeral home is also featured in “Homes of Scottdale: A Walking Tour Brochure” which is published by the Scottdale Fall Festival History Committee. 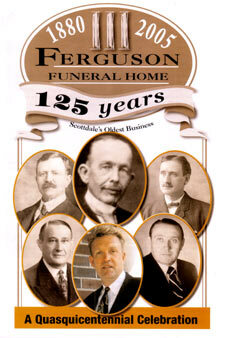 Samuel D. Aultman founded our establishment, which later became known as the Ferguson Funeral Home. It was Aultman’s service in the Civil War as a field mortuary technician that led him to begin a funeral parlor in Scottdale. He was also considered a pioneer in the emerging art of embalming. The business was passed on to J. Patrick Owens in 1899. Owens was a turn of the century undertaker and livery service operator. He decided to team up with William Ferguson, a foreman at the town’s casket factory, to create “Owens and Ferguson Undertaking & Livery” in 1901. William Ferguson was a cabinetmaker by trade and some of his original artifacts are found at the Ferguson Funeral Home Museum. Shortly afterwards, Owens retired due to illness. It was then William chose to have his sons George and John operate the Ferguson Undertaking & Furniture Store, located at 120 Pittsburgh Street, in Scottdale, PA. It was William's stern business sense and sympathetic demeanor that led the funeral home to flourish during the course of two world wars. He also had his son George to thank for encouraging him to move his business to 105 Spring Street in 1936, opening one of the first true funeral homes east of the Mississippi. William Ferguson passed away in 1951. Tragically within a year and ten days, his son George also died as a result of an ambulance accident in January of 1952. His wife, Nellie operated the firm on a widow’s license until her son, Robert B. Ferguson, the third generation, purchased the business in 1963. Bob immersed himself in a daily commitment as funeral director for close to 38 years. He trained and mentored his son, Robert B. Ferguson, Jr., the fourth generation, until his well deserved retirement in 1992. Robert B. Ferguson, Jr., bought Ferguson Funeral Home in 1993. In the early 1990s the funeral industry was experiencing a period of transition including personalization features, alternative customs, and cremation. Rob took a hand in all of this to make certain the Ferguson Funeral Home remained true to its traditions, offering an exceptional level of customer service and state-of-the art funerary offerings. Today, Ferguson Funeral home offers the latest in funeral preplanning and advanced funeral arrangements, funeral services, and cremation services. Please visit www.FergusonFunerals.com for more information. To celebrate the history of the business, Rob acquired an 1880 era domestic-made Rockfalls horse-drawn funeral hearse, and built both a vintage carriage house, and an aggregate concrete driveway with a functioning portico. He also adorned the funeral home with handmade wood carved artifacts from his great grandfather, including tables, stands, plaques, and two grandfather clocks.